In a time when many business executives are looking at what to cut because of rising payroll and healthcare costs, Michael Kulp, president and CEO of KBP Foods, a $250 million restaurant company with units in nine states, is taking an "inverse" approach. "We're using our growth as a vehicle to handle costs rather than shrinking the business down," says the 38-year-old Colorado native. "We're making sure that our growth and cash flow outpace the costs of healthcare and payroll." This approach illustrates what Kulp finds most rewarding about his job, he says. "Our mission is to develop our people personally, professionally, and financially." With that goal in mind, KBP Foods, which includes nearly 300 KFCs, Taco Bells, and Long John Silver's, took another major step. "In the last three or four years, all of our key employees have become equity holders and we've completed recapitalization that provided them their first liquidity event," he says. "It's been my dream to make our key stakeholders true equity partners. It's one of the most gratifying events I've ever had as a franchisee." His desire to give back was instilled early in Kulp, who grew up humbly with divorced parents, both of whom were teachers, and five brothers and sisters. "My mom taught special education for 35 years, so I was constantly in contact with people less fortunate than I," he says. "I always had a burning desire to make sure any future business success was paralleled by the success of others we could help." That's why each regional vice president in the company is required to sit on the board of a charity and participate in fundraisers each year. "In Atlanta, we just raised $150,000 for the children's shelter. That's out of a $1 million budget, so we're making a big impact by using our restaurants to sell coupon books throughout the year," says Kulp, who holds bachelor's degrees from the University of Colorado in marketing and Colorado Mesa University in management. 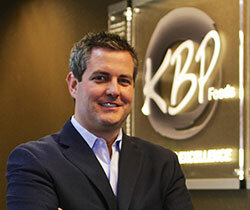 The high-energy family man and self-described "avid, ongoing student" says he's had his hands full since KBP has regularly ranked in the top 10 fastest-growing restaurant companies in the U.S.--but he still takes each person in his office out alone every year. "As fast as we're growing, I've tried to stay true to the one-on-one time we had when we were a smaller organization," he says. "It's demanding from a time standpoint, but I'd much rather have lunch or a late afternoon glass of wine with a person from our office than sit in front of a computer screen for hours." Kulp, who has always worked in restaurants and bought into an existing KFC franchise in 2006, remains highly aware of the juggling act that is life. "On the back of all our birthday cards to employees, we describe the five balls that we juggle in life as work, spirit, health, friends, and family. Only one--work--is rubber. If you drop it, it bounces back. The other four are glass, so if you drop them they break. We need to keep that in perspective."